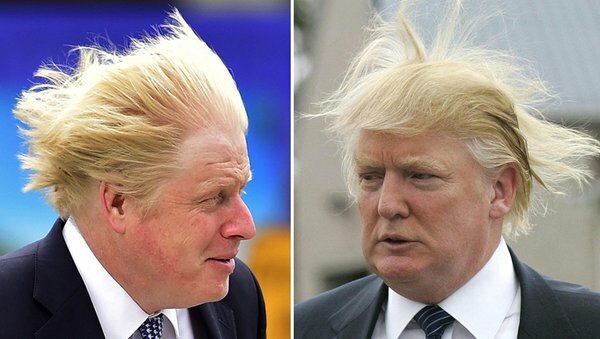 London, England — Boris Johnson, the English politician also known as the “Blonde Bombshell”, has filed suit against Donald Trump for exploiting his signature truly unruly hair as a key promotional element of his current run for the US Presidency. Johnson, formerly the Mayor of London and currently a key flag bearer for the proposed exit of the UK from the European Union said that statisticians had in the past attributed up to 5% of his vote in key elections to the name recognition afforded to his outlandish locks, and that following a meeting of the two men several years ago, Trump clearly started to cut back on visits to his barber. Johnson observed: “During the meeting Trump refused to look me in the eye. His gaze was fixed to my the top of my head the entire 30 minutes, it was quite unnerving.” Johnson stated that given current polls showing Trump and Clinton to be neck and neck that the election, and consequently the future of the free world is at stake, and if the Trump wins, Johnson’s hair could be considered at the root of the victory. While Trump was not available for comment, Gordon Ramsay was quick to weigh in on the budding controversy. Unfortunately, decorum and editorial standards do not permit us to publish those comments in either their entirety or their partiality. In sum, Ramsay had nothing positive to say about either politician, and even offered some additional color commentary on their lineage.